Yes blue could be the new you of the future after what I read today. In a recent study ¹ on chronic low back pain patients who had back pain coming from a disc in their lower backs were injected with methylene blue. 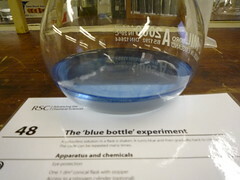 You might know methylene blue from your chemistry “Blue Bottle” experiment in school, it is a very obvious blue. What made the latest article so interesting was the high pain relief rate those patients had to their discs being injected with methylene blue. So here is a bit more on what is happening in the world on chronic low back pain from your discs. 1.1 What is Discogenic Pain? 1.2 What is Methylene Blue? There are different types of lower back pain depending on the source of the pain. Long term lower back pain sufferers could be diagnosed as having back pain coming from their lumbar discs. These can be called discogenic pain sufferers. This type of back pain doesn’t typically have the herniated disc and trapped nerve going down your leg pain. I’m not a chemistry major so I won’t go into any heavy detail don’t worry. I recommend if you want to use Wikipedia’s explanation of Methylene Blue if you want more detail. You can also watch the Blue Bottle Reaction chemistry experiment in the video below. Methylene blue has been used in the past for medicinal reasons like treating malaria, However the main reason the surgeons in the study looked to use methylene blue was for its pain relieving mechanism. They had seen other studies use methylene blue to help fractured bone pain. Methylene blue has an ability to destroy nerve endings and is known as having neurolytic properties. Well after isolating the low back patients with a discogenic source of pain they injected some with methylene blue and some not. The people didn’t know which injection they were getting. What I found amazing was the people who got the methylene blue injection had a decrease in their pain levels within 24 hours. This pain relief was then found to last for up to 2 years. Even the surgeons were surprised at the results as they know how hard treating back pain can be in chronic low back sufferers. These patients were the type who didn’t respond to typical back pain medications and were offered back surgery. So obviously more has to be done to see if this type of treatment can be released to everyone in the world. It does look promising and I see famous spinal authors like Nikolai Bogduk are excited to see the follow ups to this study. Peng B, Pang X, Wu Y, Zhao C, Song X. A randomized placebo-controlled trial of intradiscal methylene blue injection for the treatment of chronic discogenic low back pain. Pain. 2010 Apr;149(1):124-9.